Around a month ago I moved to Sheffield and into student halls. I was lucky enough to be able to nab a room in my favourite accommodation (perks of taking a gap year - I was at the front of the queue for housing) and I'm overall really happy with how it has all ended up. The aim with my uni room was, to the most part, to recreate my bedroom from home. I have definitely found this to help with any homesickness I've experienced in my first month at uni, as I found myself comforted by the familiar sights around my room. 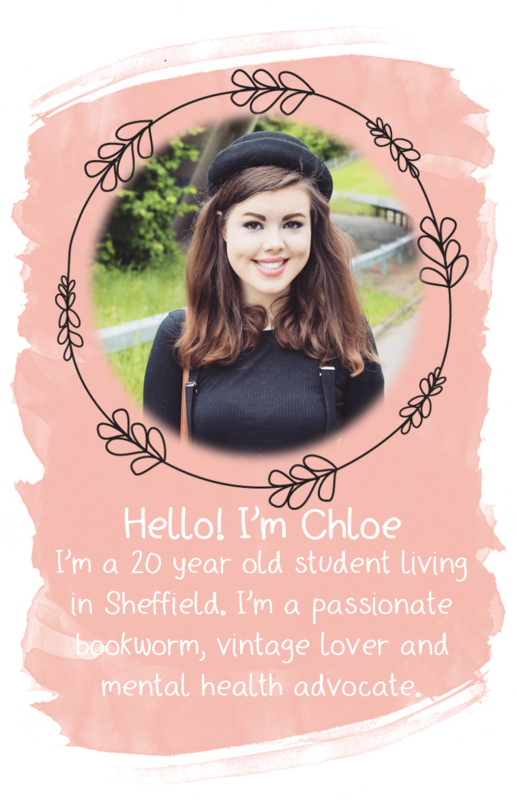 Today I am going to be sharing with you some of the things I have done to jazz up the blank canvas that was my bedroom when I first moved in. The first part of the room I'm going to introduce you to is my bedside table. My gorgeous bedside lamp is from Urban Outfitters and I'm honestly obsessed with its cuteness. Joining it next to my bed is a couple of my favourite photos. Firstly, I have a little picture of my parents from before they had me, and this photo has been beside my bed since I was really little so it really reminds me of home. I also have a framed photo of myself and my boyfriend from early on in our relationship. It's in a lovely white vintage-style frame which was actually a poundland gem, believe it or not. 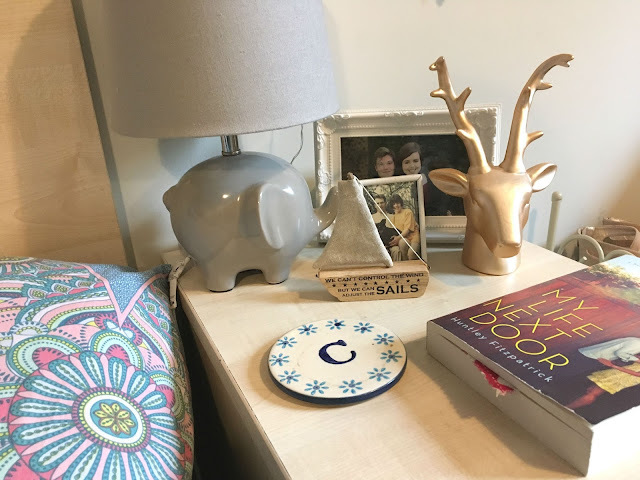 Also on my bedside table I have a lovely ceramic coaster from Sass and Belle (with matching mug, might I add), a golden statue of a deer from Dobbies and a little ship which features the lovely quote "we can't control the wind but we can adjust the sails". You can also see my current book of choice, which is My Life Next Door by Huntley Fitzpatrick. This has been one of my favourite novels for the past few years, and I did write a post reviewing it back in 2014 which you can find here. In this photo you also get a little glimpse of my bedding, which is from Asda Living and has a lovely psychedelic feel to it which really brightens up the room. My bed is my pride and joy; my happy place. In my room I have a 3/4 bed which definitely feels like a luxury for the girl who has had a single bed her whole life. To make my bed really comfy and cosy I have adorned it with a mass of pillows. My personal favourite pillow is from Not On The High Street (although I cannot find a link to the seller unfortunately) and displays the lyrics of the song 'In My Life' by The Beatles, which is one of my most-loved songs. 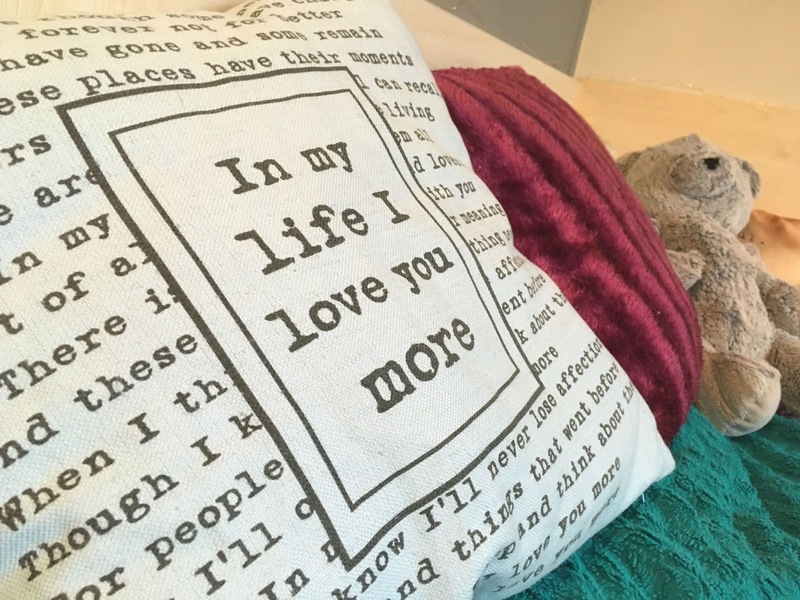 My parents had it personalised for me on the reverse of the pillow for my eighteenth birthday which adds another homely touch. 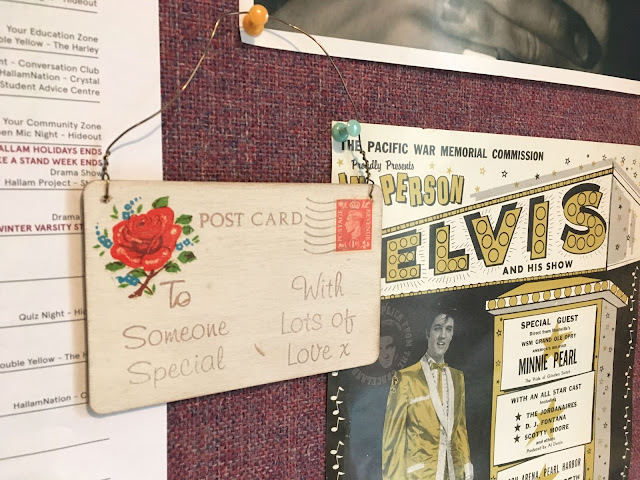 One of my favourite features of my room is my pin-board which I have filled with some little bits and bobs that are particularly special to me. At the very top of the board I have pinned up a garland from Sass & Belle which displays the quote "reach for the stars". Whilst this quote is of course motivational, I must admit I do find myself singing S Club 7 every time it catches my eye. 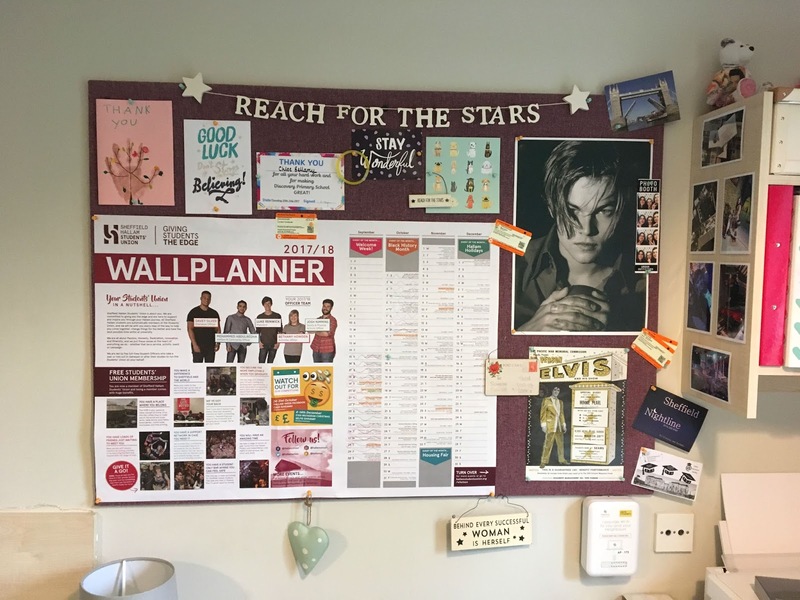 I also have my students union wallplanner which helps me to stay organised and also keep track of some of the exciting events being held by the union. Taking up another reasonable portion of my board is a poster featuring a young Leo DiCaprio; no explanation necessary. The other poster I have is a replica concert advertisement for an Elvis Presley gig. As a lifelong Elvis fan it felt only right I brought him to uni with me. Filling up the rest of the space on my pin-board is a selection of cards I have been sent in recent months, a number of train tickets from adventures I particularly want to remember and also a variety of different shabby-chic decorate bits (collected from the likes of Sass & Belle over the years). 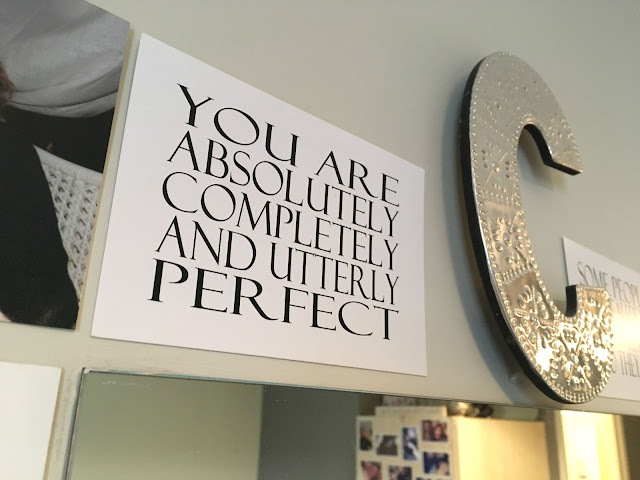 I'll admit, I spend a lot of time next to my mirror so it was important to jazz it up a bit. I have surrounded it with black and white quote postcards such as this one, broken up with some of my favourite photos. The feature piece is this decorative metallic C, which I have attached to my wall using a command hook to ensure it doesn't leave a mark. Next to my desk I have a couple of shelves dedicated to beauty and whatnot. A selection of my prettiest perfume bottles live on the top shelf and I store my makeup just below it. 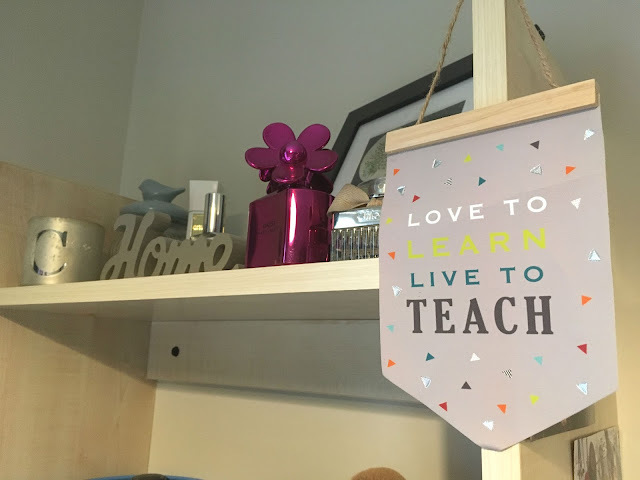 My favourite feature of this area is my teaching quote flag, which I picked up from the card factory in the summer. I am studying primary education at university and embarking into the world of teaching so it's nice to have a couple of quotes here and there to motivate me. I also have a decorative 'home' sign which was another poundland gem. So those are some of the highlights of my room decorations. I do have further areas of my room I haven't explored with you, such as my photo wall, but I have decided to dedicate individual posts to those sections. This will include (fingers crossed) a bathroom tour and a tour of the storage techniques I've used to house all of my bits and pieces. Have you got any tips on decorating your room, be it at uni or at home?